The company is one of the major Manufacturers and Exporters of Iron Watering Cans in Moradabad (India). The Iron Watering Cans, offered by the company, are quality products offered on a timely basis. The Iron Watering Cans, provided by the company, are known for their corrosion resistance. The Watering Cans manufactured by us are the easy and hassle free way of watering plants. These Watering Cans are made of high quality plastic which gives them the strength to bear the weight and are leak proof. 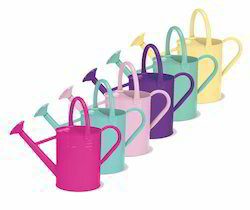 The Watering Cans are highly endurable and long lasting in nature. - Optional ACME thread insert available separately. We are offering Water Sprinklers to our client. In order to retain our remarkable position in this industry, we are providing a wide array of Garden Water Sprinkler. 1/2" Adjustable Metal Sprinkler Head. We offers and manufactures water sprinklers that are durable in quality. These automatic fire sprinklers operate at a predetermined temperature, when a part of fusible element present in it melts, allowing the plug in the orifice to push out and release water through it. We are successfully engaged in offering a wide assortment of Water Sprinkler that is widely used all across the nation. Manufactured using the best grade raw material and latest techniques, our offered sprinkler is available in different patterns, dimensions, sizes and other related specifications as per the needs of customers. All overhead irrigation, on hand lines, solid sets, permanent sets or mechanically moved systems.